Rem Haange's friends and colleagues at JET, and in Brussels, Greifswald and Cadarache, gathered around video conference screens to pay tribute to his retirement. "Hello Cadarache, can you hear us?" At the sound of the voice, the small group that had assembled in one of the ITER Headquarters meeting rooms turned around and smiled at the video screen, where people gathered in other meeting rooms could be seen—at JET in the UK, at the European Commission Headquarters in Brussels, and in Greifswald, Germany. All had come together to pay tribute to the retirement of Rem Haange, Technical Director of the Stellerator project Wendelstein-7X. Click here to read more... 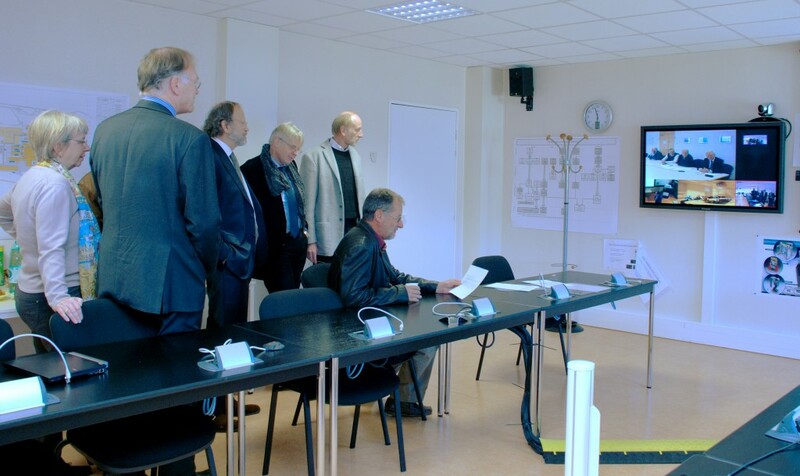 It was John How, Senior Officer for External Coordination in ITER, who read out a personal note from Robert Aymar, ITER Director from 1994 until 2003 who could not be present for the occasion. "Haange was an emblematic figure of the ITER team in Naka, and the Haange family is well-known among the 'foreign invaders' of a small Japanese village ..."